In fluid dynamics, a vortex (plural vortices/vortexes) is a region in a fluid in which the flow revolves around an axis line, which may be straight or curved. Vortices form in stirred fluids, and may be observed in smoke rings, whirlpools in the wake of a boat, and the winds surrounding a tropical cyclone, tornado or dust devil. Vortices are a major component of turbulent flow. After long nervous and excruciating wait for rains – this week finally Nature decided to bless Chennai with the heaviest spell of rains in many days as widespread rains lashed the city around yesterday night. While the southern suburbs areas missed out on the heavier spells Nungambakkam AWS recorded 80 mm at the time of post while the northern parts of the city like Madhavaram, Ennore, Puzhal recorded between 7 to 10 cms of rains until 4:30 AM in the morning. When it rains and when water maroons some places, the immediate thought is to move out ! – in city roads, people would have difficulty in transportation – buses could be leaner, difficulty in reaching out the bus stands, not many autos would be found on road, most refuse, and many ask for the moon. The mobile apps of Taxi operators would either bunk out or show astronomical surge pricing !! Within one week of Cyclone Gaja, Tamil Nadu and Pondicherry are facing another depression. The depression over the Tamil Nadu coast is unlikely to become a tropical cyclone. However, heavy to very heavy rain with gusty winds reaching up to 50 kmph is forecast for Tamil Nadu. The path of depression has shifted slightly northward during the past 24 hours and hence, Chennai will get heavier rain than what the previous forecasts suggested.. As the depression moves inland tomorrow, rain will still continue along the coastline from Chennai to Pondicherry. In the past 24 hours till 3 pm Wednesday, coastal Tamil Nadu has received over 100 mm rainfall across many regions. According to IMD, Karaikal received the highest rainfall at 68.9 millimetres in the last 24 hours. In TN, Nagapattinam received the highest rains at 41.6 millimetre and Thiruvarur at 24.2mm. While Kancheepuram received 29.4 mm, Cuddalore received 20.1 mm. Chennai district received 15mm of rainfall, with Meenambakkam receiving 60mm and Nungambakkam receiving 20mm. the bulletin issued by India Meteorological Dept,Chennai @ 22:00 on 21.11.18 reads : _ Morning's well marked low pressure area now lies over Southwest Bay of Bengal and adjoining Tamil Nadu coast today, the 21st November 2018. (22-11-18): Moderate rain or thundershower is likely to occur at most places over North Tamil Nadu and Puducherry. Light to moderate rain or thundershower is likely to occur at a few places over South Tamil Nadu. Vortex over NE TN centered within half a deg of 12.5N/79.5E – with heavy rains lashing out the city and its suburbs, the Q in mind of Chennaites is whether these downpours will help them escape the looming water crisis. There is yet to be authentic information on any copious inflow of water to the four reservoirs in Red Hills, Cholavaram, Poondi and Chembarambakkam. Elsewhere, Saudi Arabia has been suffering from heavy rainfall since 10 November, seriously damaging houses and leaving 30 people dead, according to the Saudi Gazette. 30 people have died in Saudi Arabia over the past few days as a result of heavy rains and subsequent floods, the Saudi Gazette reported earlier. Rain falling Wednesday in some areas of Northern California could help crews fighting a deadly wildfire. But it could also raise the risk of flash floods, complicate efforts to recover remains and make life even more difficult for people. Heavier rain is expected later in the day in the Paradise burn area, which is about 140 miles (225 kilometers) north of San Francisco, where the Camp Fire has killed at least 83 people, including two victims who were found Wednesday in burned homes. The blaze also destroyed more than 13,000 homes. 22nd Nov 2018 @ 08.00 am. 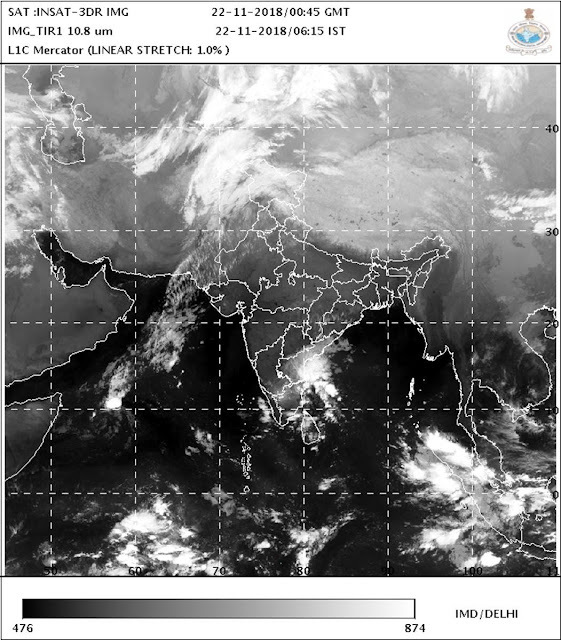 INSAT pic of 0615 IST today.